Fundamentally, ESD (electrostatic discharge) is a discharge of static energy that emits heat, light, and sound. Lightning is the most powerful form of electrostsatic discharge (ESD): a release of light, heat, and sound. However, in electronics manufacturing, ESD mostly occurs at micro scales invisible to our senses of sight and sound. This is problematic because we cannot detect it easily. In fact, most ESD damage can only be seen with the aid of a microscope. Worse, we know from controlled testing that merely having an ESD Program that mandates all personnel wear wrist straps and use ESD safe transport materials can significantly reduce device failures. 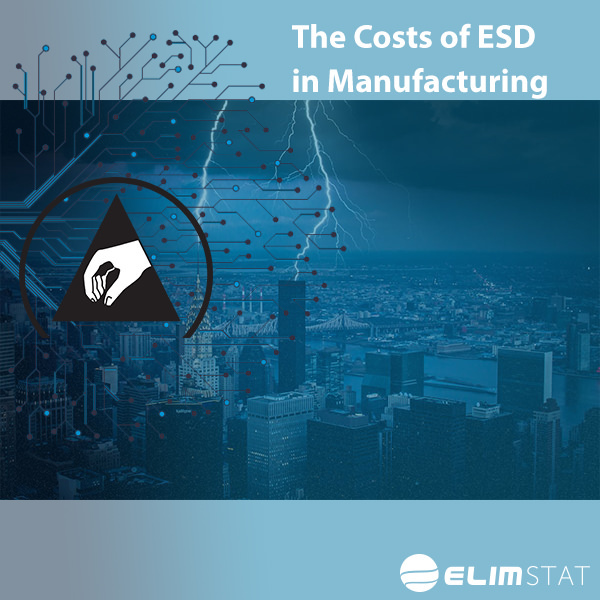 In 1983, Western Electric found that implementing an ESD Program reduced up to 75% of the device failures they were experiencing at one of their plants. Founded in 1982, the ESD Association is a professional voluntary association dedicated to advancing the theory and practice of electrostatic discharge (ESD) avoidance. From fewer than 100 members, the Association has grown to more than 2,000 members throughout the world. From an initial emphasis on the effects of ESD on electronic components, the Association has broadened its horizons to include areas such as textiles, plastics, web processing, cleanrooms, and graphic arts. In the United States, the standards used in ESD Programs are codified by the American National Standards Institute which has adopted ESD Association (a global association) standards. For those interested in developing ESD Awareness at their workplace, the ESD Association does offer training and certification regularly. Implementing an ESD Program involves standardizing ESD Grounding Methods at your workplace, and carrying out regular ESD Testing to ensure all fabrics, plastics, and equipment complies with ANSI / ESD Association standards. ESD is caused by the presence of static on the surface of insulating materials: carpets, glass, plastics, wood, etc. nsulators can hold positive and negative charges in pockets across their surface. When enough static builds up on the surface of an insulator, it explodes as electrostatic discharge (ESD), which is what damages electronics. You can test materials for resistance by using metering kits to run voltage through ESD products and then measure their resistance. So how do you read the results from measuring? You reference the Triboelectric Series. This is how you will know if something is a conductor or static dissipative, meeting a standard, and develop your control limits. So how do you deal with insulators? You can create pathways for electrons to travel around the insulators into the ground. This is known as grounding. You can also ionize air molecules so that charge is blown off insulative surfaces. This is known as ESD ionization. Grounding involves using a mat and a wrist strap to conduct static to ground. This involves connecting grounding cables to the mat so that it is plugged into electrical sockets with ground connections. It also involves connecting your body to the ground. This involves wearing appropriate grounding apparel like wrist straps and heel grounders. Ionization involves blowing air molecules that contain positive and negative charge over insulative surfaces so that charge decays rapidly off them. ESD Air ionizers are either operated on alternating current or direct current blowing patterns through emitter points located in front of the fans blowing the air. Depending upon the geometry of your static problem ionizers can be effective at mitigating charge on assembly lines, in clean room gowning rooms, inside machines, and at soldering workstations. Ionizers reduce charges that prevent ESD but are also effective at eliminating electrostatic attraction of particles onto sensitive electronics and people entering a clean room. Alternating Current is preferred to blast charge off surfaces at close range. Direct Current is preferred when you want consistent waves of positive and negative charge or to the control the timing of that air blowing across the surface. If you consider implementing an ESD Program keep in mind that grounding is generally cheaper than ionization. However, for static being created inside a machine or by fast-moving assembly lines ionization is almost the only way to ensure charge decay. Western Electric North Andover Works (1983). “ESD – How Often Does It Happen?” G.T. Dangelmayer, EOS-5, pp.1-5, 1983. Previous post: How Do ESD Air Ionizers Work? Next post: What is a Faraday Cage?